Q. Should I disable Hyperthreading in my dual-boot XP PC? I've just got a dual-core PC laptop which I have created as a dual-boot machine — one boot-up runs a clean, cut-down operating system (XP Professional) to reduce CPU, memory and hard drive load with music software. The problem is I don't know what it's safe to leave on and what I really should turn off, and I don't know whether to disable Hyperthreading in the BIOS. The machine is running 2GB of RAM, a 100GB 7200rpm hard drive (partitioned three ways), and two 2.16GHz processor cores. My sequencer is Cubase SX3, and I have a fair swag of VST instruments and plug-ins to install, as well as some very large sample libraries on external Firewire drives. What can I disable? What should I leave alone? Can I use a wireless mouse? Another quick question concerns linking or networking multiple machines to share processor load. Is Cubase 's VST System Link adequate? Is FX Teleport a better option? Will FX Teleport give me full transport control of multiple computers if I'm running audio on one machine and video on another? Can you use VST System Link and FX Teleport in tandem? Are there better options? PC music specialist Martin Walker replies: I'm pleased to hear that you've set up a dual-boot system, since, while some musicians insist that they don't notice any performance drop when making music on their Internet-enabled, general-purpose partition, I find it this hard to believe, even if you carefully disable all your background virus- and spyware-checkers, firewall software, and so on first. As for what features you can leave on and what's better disabled, look no further than my comprehensive guide to Windows XP Audio Tweaks in SOS September 2006 (www.soundonsound.com/sos/sep06/articles/pcmusician_0906.htm), which covers essential, useful and pointless tweaks, as well as a selection of recommended non-Windows tweaks. I didn't mention Hyperthreading in that feature because it's highly unlikely that you'll need to disable it unless you're running any old software that was written before it first appeared in new Intel processors back in 2002. In my opinion, any audio applications that have been updated in the last four years should at least be able to ignore Hyperthreading when it's enabled, even if they can't take advantage of its pseudo dual-processor feature to improve performance. The only application that's ever given me HT problems was Gigastudio, but they were solved with version 3.04. As for wireless mice, many musicians now use them, and I covered them as part of 'Pointing Devices For The PC Musician' in Sound On Sound November 2005 (www.soundonsound.com/sos/nov05/articles/pcmusician.htm). Some people find them unwieldy because their batteries make them significantly heavier than the corded variety, and you may experience a short delay between moving a wireless mouse and seeing the corresponding movement on screen. Other than this, the only advice I would offer is to be wary of exotic mouse drivers supporting lots of extra buttons and high scanning rates, which could possibly cause conflicts with some audio software. Cubase VST's System Link. Sharing processor load among several computers is a popular way to cope with songs containing lots of plug-ins and software instruments, but VST System Link and FX Teleport are very different beasts. 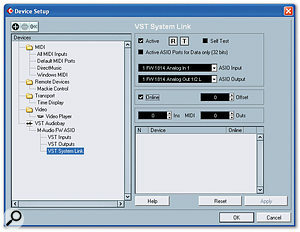 VST System Link is proprietary to Steinberg and requires an audio interface with digital inputs and outputs for each computer in the network, since it uses one bit of this link to keep the machines in sync and send data from one to the other. Some audio interfaces don't work correctly with it, but I'm sure its many users find it perfectly adequate for even complex setups, since you can run Cubase or Nuendo applications on the slave machine as well as the host one, which would certainly be an advantage when running video and audio simultaneously. If, on the other hand, you simply want to run extra VST Instruments and associated plug-in effects on the slave machine you can use Steinberg's much cheaper V-Stack, which can power up to 16 VST instruments without sequencer software. FX Teleport is rather different in that it doesn't require any audio or MIDI hardware on the slave computers. Instead, it sends both audio and MIDI data over a standard network cable between the host and slave computers. Essentially, the VST plug-ins and software instruments installed on the slave machines appear as extra options inside the sequencer running on your host PC. Thus, the slave computers don't require transport control. However, as far as I can see you couldn't use FX Teleport to run video on one machine and audio on another, although you could run both audio and video tracks on the host PC, and offload much of the audio processing to the slave machine. You could theoretically run VST System Link and FX Teleport in tandem, but I'm not sure I would recommend it, since you might have a hard time balancing up all the different data flows through the various PC busses to ensure maximum throughput (or to put it another way, you might experience audio clicks and pops that require a lot of tweaking to get rid of). I suspect it would be far more productive to choose the most appropriate type of music network for your purposes and stick with just one approach.